Monday's murder-suicide was tragic on so many levels. One that truly strikes home is that Alissa Blanton was not granted an emergency injunction when she requested it. Instead of denying the injunction, the judge issued an “Order Setting Hearing.” This is a process where a judge, who does not feel that there is enough information to give an injunction, sets a hearing date for both parties to appear, plead their cases and then decides whether or not an injunction should be granted. In these cases, an already terrified victim is left legally unprotected for 14 days while their alleged perpetrator, be it a stalker or batterer, is given not only notification about their action to end the relationship, but has14 days to continue the behavior that caused the victim to seek the injunction in the first place. The most dangerous period for a victim is when they attempt to end the relationship. An injunction is frequently the perpetrator's first notice that such a decision has been reached. Harbor House survivors have reported coming home (if they live together the abuser would still be allowed to live in the home during the 14 days) and being beaten because the OSH had been served. This is extremely dangerous and, as we saw on Monday, often deadly practice that need not ever happen. Harbor House has repeatedly requested that judges either grant or deny injunctions but to never choose OSH because of the vulnerability of the victim. When an injunction is denied, the batterer is unaware of the action and the victim can then amend and resubmit their petition. The practice of OSH became such a serious concern in Orange County that Harbor House began tracking the outcomes of cases based on how high the victim’s score was on the danger assessment (which tells us how likely they are to be killed). Ideally, we would like to see those scoring low on the assessment (although that is not a guarantee of safety) as the ones denied and those scoring high as the ones granted. For various reasons, judges often have no choice but to dismiss because a form is filled out incorrectly or not completely or there really is no legal basis for the injunction. Removing those situations, we would like to see about an 85-95% granted rate on highly dangerous cases. Due to the specialized domestic court here in Orange County, our judges are some of the best in the state at identifying what is really serious and what may not be. There is still room for improvement. Below is our latest report on how cases are doing here in Orange County. You be the judge. 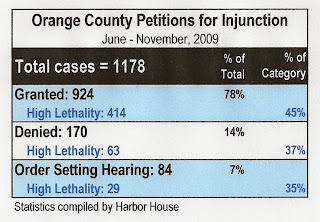 As you can see in the table (left), sixty-three petitioners who were assessed by Harbor House as having a high likelihood of being killed or severely injured had their injunctions denied. Twenty-nine had an Order Setting Hearing where the batterer was notified of their action and they were left without protection. It is important to be aware of this practice, the danger in which it puts the victim, and that it is easily preventable. WFTV has a copy of the petition for injunction available here. So, you advocate eliminating due process and just setting an injunction against any person who makes an accusation? If the allegations in the petition are not sufficient to grant a temporary (2-week) injunction while the parties wait for their hearing, the judge should deny the petition - thereby keeping the Respondent unaware that the Petitioner has sought injunctive relief. An OSH tells the Respondent that the other party wants an injunction but provides no legal protection to the Petitioner while the hearing is pending. Judges should deny the petition. We need to find a way to educate victims on Florida statute. "He's 40 - She's 17!" A Black Hole in the Court System?